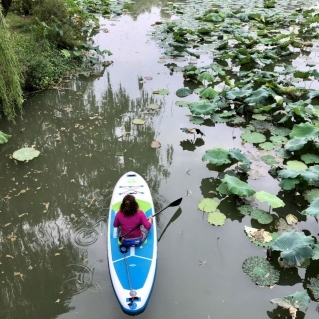 I found myself on an urban paddling adventure in the ‘small’ city of Hangzhou, population eight million. 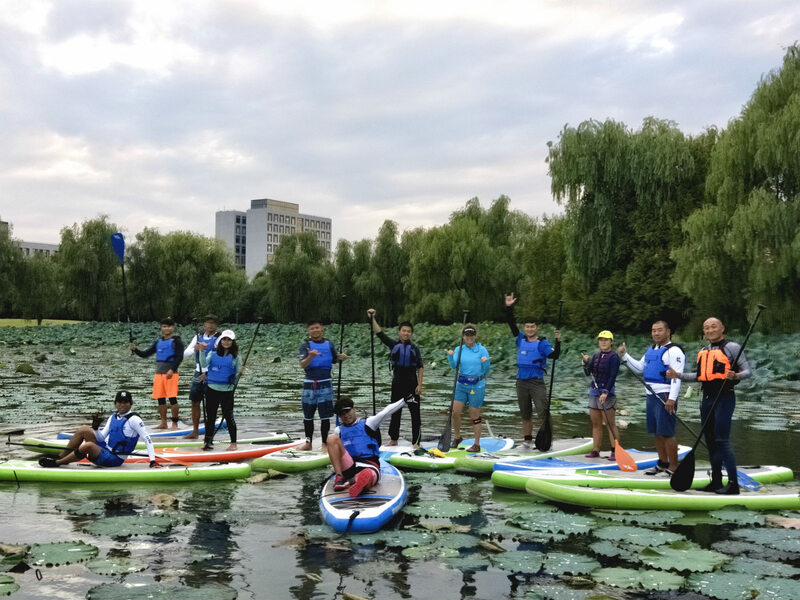 The third-ranked university in China had invited me to teach SUP yoga courses and American Canoe Association (ACA) SUP Instructor Certification courses. I had never been ‘confined’ to an urban environment before. And even though I speak three languages, Chinese isn’t one of them so, for the first time ever, I had to rely on a translator. Have you ever dreamed of getting paid to travel the world and contribute to others by teaching your passion? I’ve been doing it for over 14 years, but my latest teaching adventure in China left me with profound insights. Here are some things I learned that may help you snag a gig teaching SUP abroad, set yourself up for success while you’re there, and recover when things don’t go as planned. In the past, I assumed if I just did my thing and did it really well, opportunities would fall on my doorstep. I assumed wrong. The traveling/working gigs I’ve gotten are the result of proactive steps taken in the paddling world. For example, my first guiding gig in Mexico happened after I cold-called the owner of the rafting company and asked for a meeting. 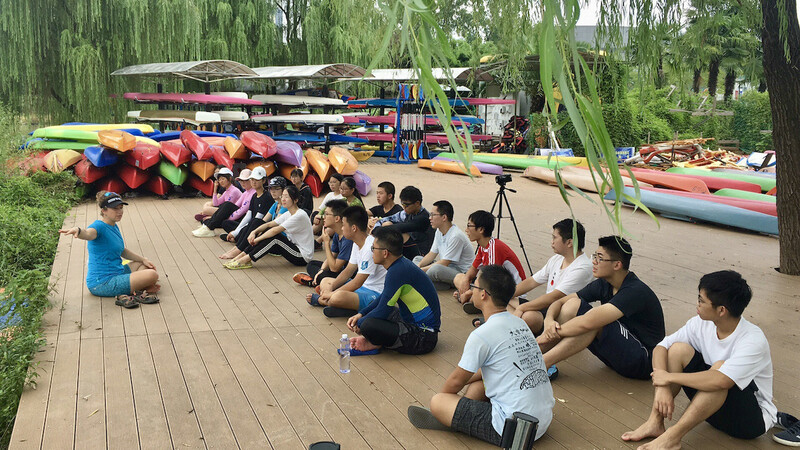 The invitation to teach in China came at the U.S. American Canoe Association National Conference. I participated in the pre-conference L3 SUP Surf Instructor Course and Ge Wu, a Chinese paddling instructor, stood in as my practice student. After working together and showing him my Yoga for Paddling book, he asked if I would be interested in coming to his university in China to teach. I didn’t need the course for my day-to-day work. I took it because I’m really stoked on SUP surfing right now and wanted to improve. 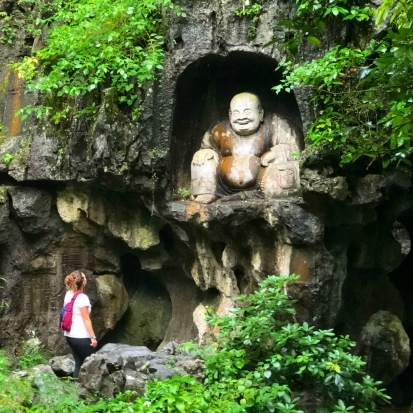 Over the years, I’ve found that investing in and following my passion often creates results in unforeseen ways—like the invitation to teach in China. My advice to you is, take a course you’ve been wanting to take or attend a conference where you’ll meet people who are leaders in their field and share similar passions. It’s worth the investment and time. And when you’re there, tell people what you do and what you’re passionate about. People don’t know what you’re up to unless you tell them. I always keep a copy of my book with me to share for this very reason. 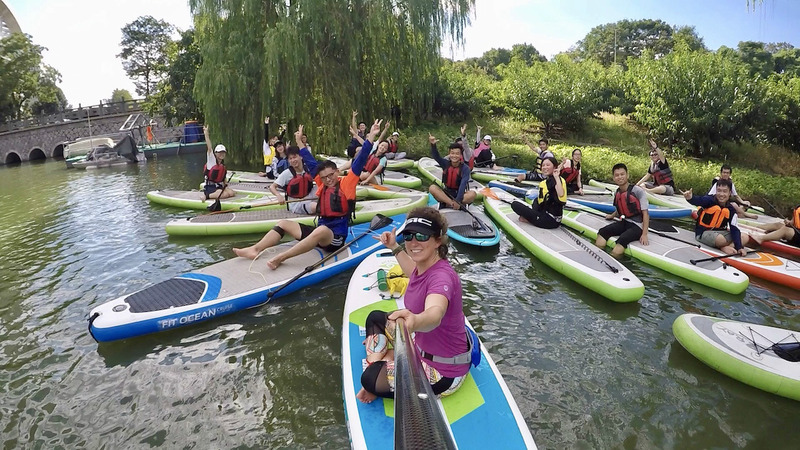 The university in China had a large fleet of inflatable SUPs, but when I first arrived a lot of them didn’t have fins and some of them didn’t hold air so well. The paddles were heavy and plastic. Could I have managed using their gear, yes. Was I stoked I had brought my own? Yes! And not just for myself. Turns out, after we ordered more fins and patched some boards, we had just enough usable boards for the number of students taking the courses. I would have been disappointed to know I had taken a board that a potential student could have used, especially since it’s so easy to travel with an inflatable SUP. Inflatables fall within the restrictions of a regular checked bag, so they accrue no extra charge. I own a wonderful three-piece carbon breakdown paddle that fits perfectly in the bag with my board. There’s plenty of room for my leash and inflatable PFD (although be aware that some security checkpoints won’t let you fly with a CO2 cartridge even in your checked bag). From the standpoint of stress reduction, traveling with your own gear is very helpful. Although, the extra stuff and questioning from TSA can feel briefly stressful, knowing that I have everything I need to get on the water and teach regardless of what’s going on with my host’s gear is very affirming, and one less thing to worry about. 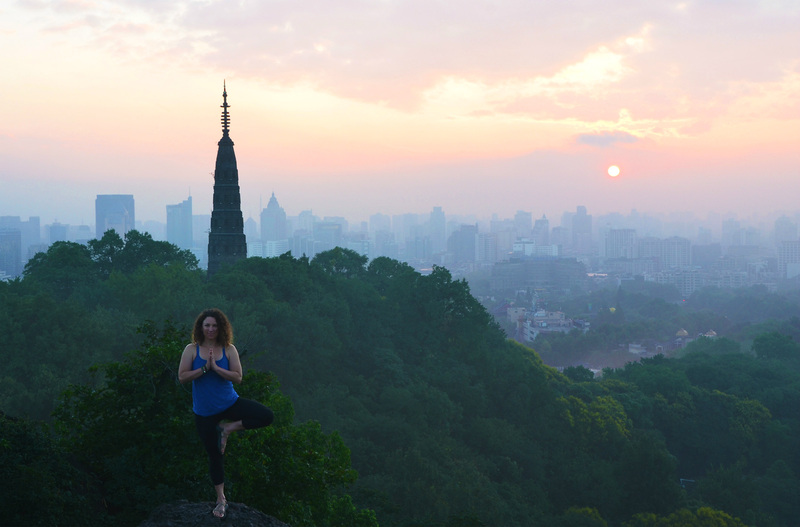 Experienced travelers know that things don’t always work out as planned, and unless you want to suffer through the experience, you’ve got to let go of expecting things to look the way they do at home. 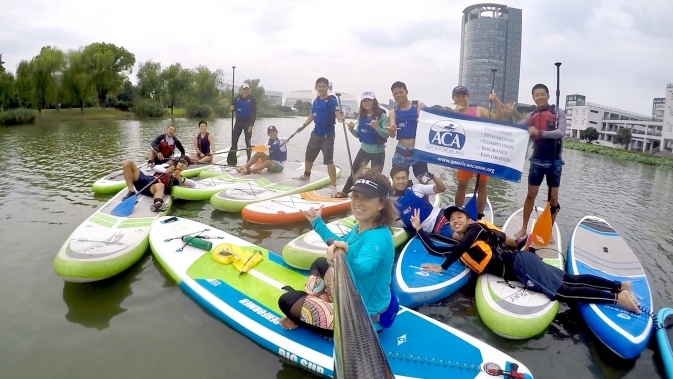 Attachment to a comfort zone isn’t workable when teaching paddling abroad. Instead, be like the river and go with the flow. My class sizes exceeded any other SUP yoga classes I’ve taught in the past. I didn’t have an assistant, only a student translator to help communicate to the 20+ novice paddlers in front of me. Sometimes that felt very chaotic. 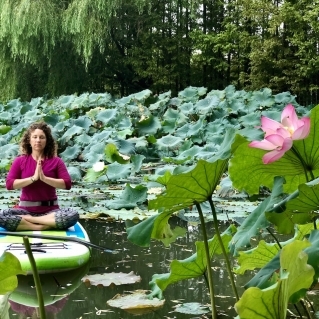 Was it ideal for teaching SUP yoga? No. Was I able to be effective? Yes. Did it make me a better teacher? Yes. In the midst of chaotic moments (like trying to anchor all of the paddlers with enough spacing in between while still being able to hear me), I would pause, take a breath and tell myself to just go with it. 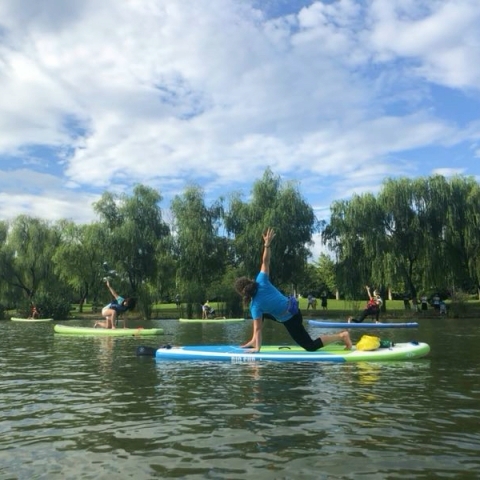 The chaos would pass and what was present was the amazing opportunity to introduce these young people to the joy and physical benefits of getting outside, paddling and practicing yoga. Had I not been flexible I would have made myself and them miserable. To be able to go with the flow, it’s important to carve time out for yourself to decompress. I would paddle solo after evening classes as the sun was setting. 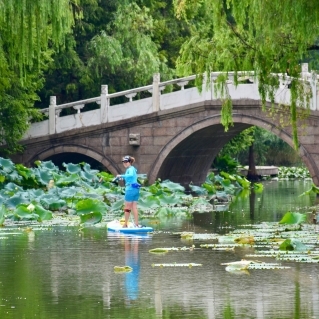 The lotus garden past the traditional bridge was my favorite place on the lake. I loved watching the little ducks run across the lotus pads and the vibrant pink of the lotus flowers. Other evenings I accepted invitations to dinner with my students, even when I felt tired. These social experiences wouldn’t give me the downtime that paddling solo did, but they did provide me with lovely human and cultural connections, delicious food and some of my favorite memories. If you want to travel and teach paddling then I suggest you start the practice of going with the flow now when you’re at home and in your comfort zone. That way you won’t get thrown off center when the time comes to deal with a less-than-ideal situation. Yoga, meditation, mindfulness practices and paddling rivers have all contributed to my ability to go with the flow. When I lead Instructor Certification courses I teach my Instructor Candidates (ICs) that an effective instructor can teach a skill without speaking a word. During my instructor courses in China, I realized how effective this strategy is in transcending cultural and language barriers. Teaching through a translator meant I had to rely heavily on their demonstration quality to be able to assess their teaching skills. When it came to the IC’s impromptu stroke lesson assignments I decided against using the translator. If they were an effective instructor I could tell exactly what they were teaching just by watching their demo and their body language. Most of the time I could also tell exactly what their explanation points were for the stroke. If I had a question, I asked through the translator, but most of the time it was clear. The experience taught me to be more effective in listening and looking for communication behind (or in spite of) the words. How to do this? Be VERY present with the person who is speaking. What is their body language saying? What does their facial expression convey? Start now by noticing how you listen to people who speak the same language as you. Do you actually listen or are you just thinking of what you want to say next? Are you paying attention to their body language? Do your surrounds distract you? Start asking these questions of yourself and you’re on your way to being a great listener and a great teacher. When teaching requires words, use simple language and filter the material down to what’s absolutely necessary. Using a translator will add time to your lessons and you’ve got to be okay with leaving extraneous stuff out. And remember to pause for the translator! That was the most challenging thing to remember at first. In fact, pausing for three seconds after you or someone else speaks is a great practice for mindful conversation in general. One of the many benefits of teaching abroad that go well beyond paddling. Now that you’re there and working in an amazing new place don’t forget to immerse yourself in the culture. That comfort zone can be very seductive so it can be easy to fall back into socializing only with people who speak your language, other expats or simply staying in your room or in the area where you’re teaching. Get out and explore and talk to the locals, if only through body language. Sometimes just sitting with people can give you insight into their culture and lives. 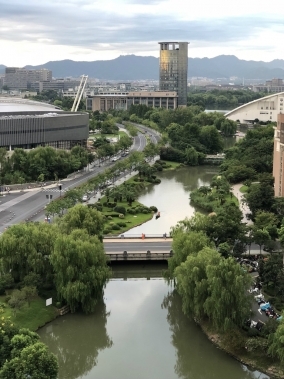 Hangzhou is actually quite famous in China for historical sites such as West Lake (Xi Hu), Lingyin Buddhist Temple, The Traditional Chinese Medicine Museum, the old capital city of the South Song Dynasty and the Grand Canal. My students were very excited to show me around the city and these sites. A lot of people had warned me about the food in China, and although there were a few interesting dishes, I found the food to be amazing. Some of my favorite memories are sharing meals with students. At restaurants, the Chinese place all dishes on a ‘lazy susan’ in the middle of the table and share them family style. My students asked if it was true that in America people order individual plates. They found that really weird! 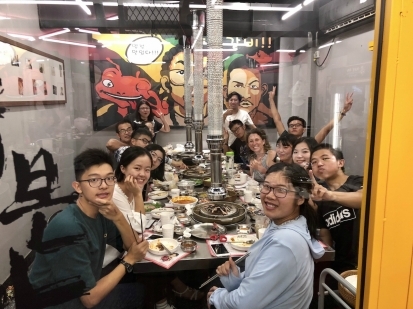 Eating, touring around and being with people is an important way to expand our horizons and our understanding of people and places. It reminds us that we are all more alike than we are different, and that’s an important understanding to have as a teacher. 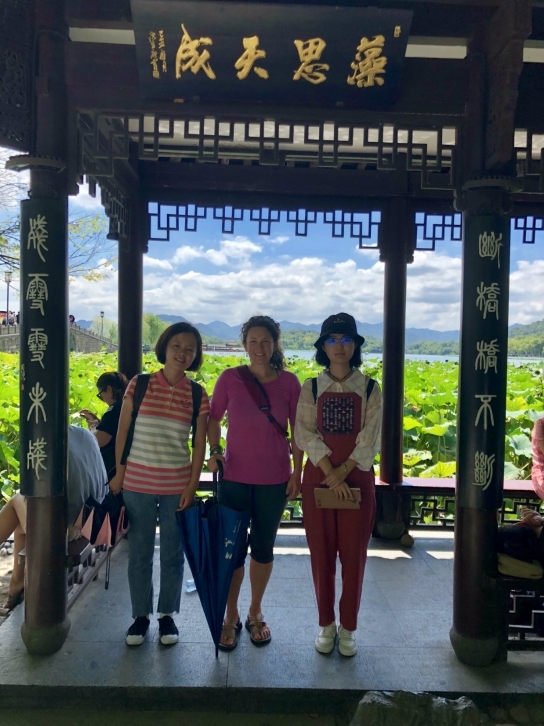 Anna with two of her students in West Lake. The last, yet most important piece of advice I want to give you is to be there for your students, especially the difficult ones, the ones who struggle and the ones who are hardest to communicate with. Yes, it’s wonderful that you’ve created a cool job or opportunity for yourself, but authentically sharing your gifts and caring for your students is your priority. Not only will your students benefit, but you’re also more likely to get other great opportunities if you actually care about the quality of what you’re offering. You may think you know what you’re giving your students, but really you have no idea of the possibilities you’re creating for them. 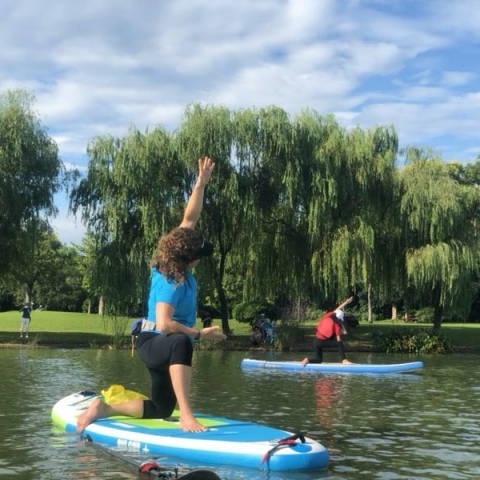 One student, previously afraid of water and who didn’t consider herself a “sports girl” said the class motivated her to strengthen her body and try different sports. Another student noticed the benefits of performing such a calming exercise to find relief from a fast-paced world of overwhelming pressures. And others simply appreciated the time spent outdoors instead of behind a screen. Wherever you teach paddling, when you care deeply about what you’re teaching and about your students, those feelings will be evident and your students will return them with genuine appreciation. Having a positive impact on people’s lives is truly the best gift, and doing that on an international level is the greatest honor and reward.